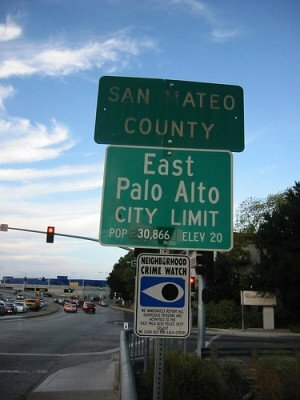 “You don’t want to go to East Palo Alto! It is on the wrong side of the tracks”, was the advice I was given when looking for somewhere to rent in Silicon Valley back in the late 90s. East Palo Alto has been very poor since the early 80s and has much higher rates of crime than the other bits of Palo Alto that just got more wealthy and posher during the technology dotcom bubble. A similar demarcation exists in Bloomington, Indiana, where I also once lived. Those on the wrong side of the tracks live in poverty and are often regarded as trailer trash whilst those on the right side are university dons and students, respectable and educated. A clear town and gown divide. More generally, every country has its north and south or east and west. If you live in the south of England you consider those ‘up north’ to be working class, poor and hard-nosed. Conversely, if you live in the north of England you consider those ‘down south’ to be stuck up, wealthy and snooty. The dividing line is located at the infamous Watford Gap service station on the M1. Apparently, nearly 75% of the English are prejudiced against their northern or southern neighbours. The same can be said about cities. People south of the Thames rarely venture north of the river outside of work and vice versa. Each side of London has its own culture, accent, street fashion and views about people living on the other side. Such urban splits are perpetuated right down to the street level. There is a street in Cambridge, UK, called Mill Road that is divided by railway tracks. On one side is Romsey and on the other, Petersfield. 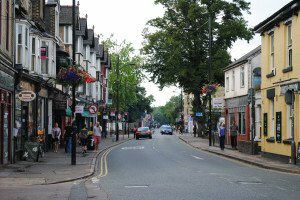 Romsey people believe Petersfield is less safe and has less community feel than their neighbourhood. But what do those in Petersfield think? Do they regard themselves as being poorer – whether financially culturally or economically? Do they think it is more or less unsafe than Romsey? Another case of being on the wrong side of the tracks? Are the perceived differences about the other side real or imagined? This is the question being asked on one of our current research projects run by Lisa Koeman and Vaiva Kalnikaitė as part of the ICRI Cities. Instead of simply asking people on the street what they think, we have employed electronic voting devices to mediate. 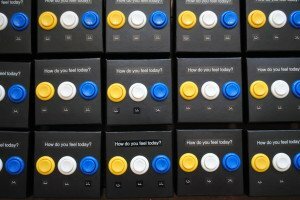 18 of these portable devices have been designed, custom built and placed in shops along the street – some on the Romsey side and the others at the Petersfield end. 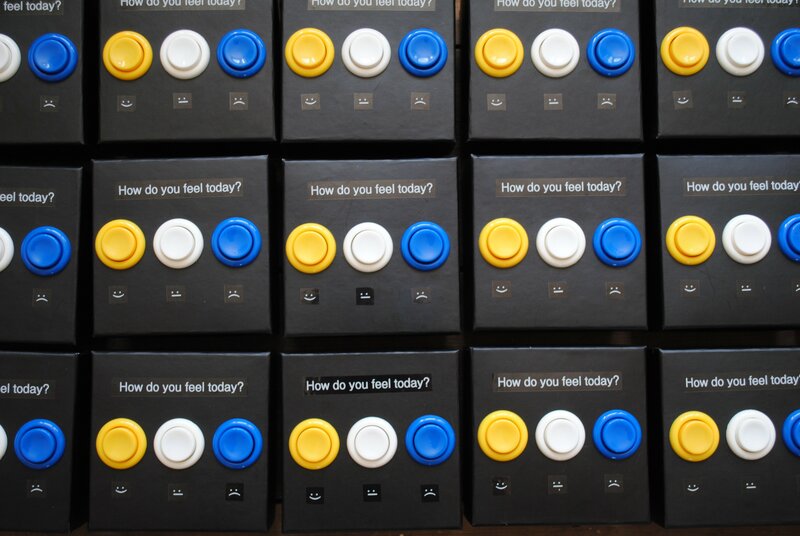 Shoppers get to vote on a variety of questions to do with the neighbourhood, by simply pressing one of three coloured buttons, depending on whether they agree, are neutral or disagree. Statements include “the street has a real buzz today”, “I feel socially connected” and, “I feel at home on Mill Road.” They are of course free and encouraged to talk at large about the issues with others in the shop or street. The logged votes are then aggregated for each shop and displayed as a public visualisation outside them. 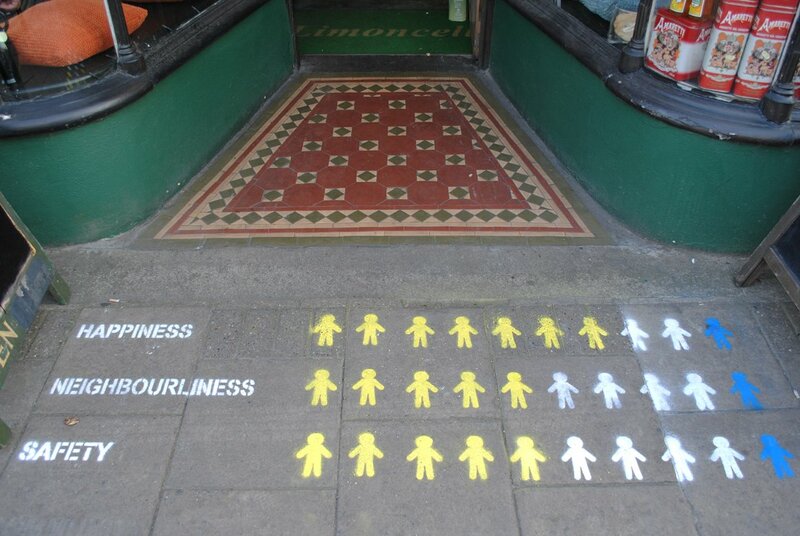 Local graffiti artists spray the breakdown of the votes as a percentage for each choice – using temporary chalk and stencils – onto the pavement next to each shop taking part. This then becomes the talking point for for all to see, be puzzled about and compare. 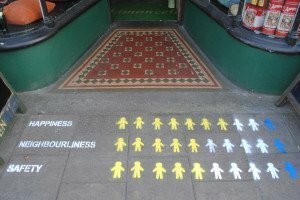 At the end of the week an evocative visualisation of all the votes for all the questions, from the two parts of the street – divided by the tracks – will be designed and sprayed on the bridge pavement to show whether and what are the differences, as judged by the shoppers and shopkeepers. Will it be the case that the perceived economic and social differences are as marked as we are led to assume? If you want to have your say pop into one of the participating shops and cast your vote. The project also hopes to enable residents and visitors to the area to find out more about the street – which is known for its vibe, diverse community and international shops.